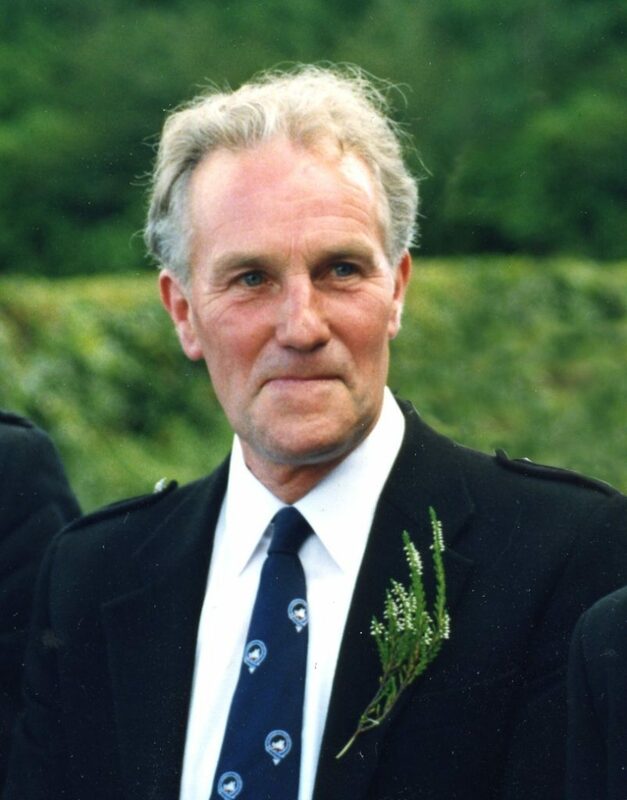 Willie Innes was born, on Christmas Day 1931 at Invercloy. He was the second eldest of five children of John Innes and Bessie McNicol. At the age of 4, Willie moved to 20 Douglas Row with his parents and lived there, more of less, for the next 82 years. 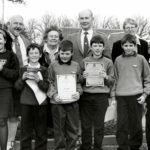 Willie attended Brodick School until he was 14 when he left to become an apprentice joiner with Arran Estate for whom he worked for 20 years. Willie then left the estate to start up in business with his brother Colin and so Messrs W & C Innes was born. Willie worked in the business with Colin until 1997 when he retired. Willie married Nan Hume in 1957. He had two daughters, Beth and Lindsay, five grandchildren and three great granddaughters. His golfing achievements are remarkable. Eight times Brodick Golf Club Champion, in four different decades and eight times Arran Open Champion. He was Arran Champion of Champions the first three years the competition was held, and was also Bute County Champion in 1969. He won the McCarfrae Trophy (effectively the stroke play championship) 15 times between 1957 and 1990. He represented Brodick in the Hope Cup over an almost unbroken 40 year period, and also represented Buteshire in County matches. His golfing achievements are too numerous to mention here, suffice it to say that if you look at the names on almost every Brodick or Arran Trophy, Willie’s name will be on it. He was club captain on an unprecedented three occasions: 1962-65, 1978-80 and in 1997-98, which included the club’s centenary celebrations. Willie was also a good badminton player and footballer, playing for Brodick and during his national service with the RAF, on the Isle of Man. Willie had an amazing 18 holes in one and was delighted to attend The Belfry with other such golfers. If you asked him how many holes in one he had he would say: ‘one less than Jim Reid’. Willie loved, The Hope Cup and he derived the greatest pleasure when Brodick beat Lamlash. His next greatest pleasure was when Whiting Bay or, indeed any other club beat Lamlash! Willie loved these games and respected his opponents, even when he lost. 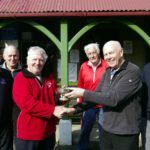 He relished a competition and in the summer he would be found on Brodick Golf Course most evenings taking on the challenge of his mainland friends in fiercely contested four-balls. His most prominent friendly game was a four-ball when he holed his tee shot on the 18th to square the game! He also spent a lot of time practicing and encouraging juniors and beginners. Willie was delighted to be asked to become an honorary member of Brodick Golf Club. He was the first recipient of the Dougie McFarlane Trophy for his outstanding contribution to golf on Arran. He was proud of this although those who knew him will know that he never spoke about his achievements on or off the golf course. He let his golf clubs do the talking. Brodick Golf Club played a huge part of, not just Willie’s, but also Nan’s social life. The highlight of the year was the annual dinner dance and prizegiving. Willie was a bit of a twinkle toes – he loved to dance, in particular an old time waltz. Willie loved pipe band music. On Highland Games day, he always went to the pier to meet the bands off the boat and marched along behind them. Even last year when his heart was failing he went, and walked behind the band all the way back to the sports ground. Willie was a retained fireman for many years. He was also a special constable, for a period, and a member of the British Legion. 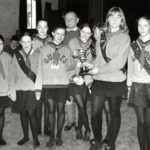 He cherished being a member of the Arran Mountain Rescue Team. If needed, all other commitments were put on hold. His photograph can still be seen in Robert McLellan’s Book, The Isle of Arran, where he is pictured on top of North Goatfell. When he retired he walked the West Highland Way with three friends, in aid of the mountain rescue team. Willie only travelled abroad on three occasions and would be seen on the beach in Spain wearing his golf trousers and Pringle jumper! Sadly, Willie was struck by ill health in his later years. He suffered a serious brain haemorrhage in 2003 at the age of 71. He was at deaths door. He had brain surgery and was in a coma for several days before he was able to communicate. He did not know his family. Against all odds, he survived and after three months of rehabilitation on the mainland, he returned to Nan at number 20. His lifelong friend Kenny Bayne, who was brought up in 19 Douglas Row, took him out every Tuesday in all weathers for a walk followed by a visit to the café. He tackled his illnesses with the same determination that he showed at golf. His recovery was slow but steady and although he could not add or subtract, he put in a huge effort and began to relearn much of what was lost. He learned to drive again and also began golfing – a true miracle. A few years after his brain haemorrhage, he played in the Brodick Golf Club Championship qualifying rounds and qualified in 16th place – unthinkable after his illness. He was drawn to play the champion, Ewan McKinnon. Ewan was a wonderful opponent and showed Willie the utmost respect – but no mercy. At the first, Willie described Ewan’s drive as ‘still rising when it passed my ball’. Willie’s health began to deteriorate seriously shortly after this and golf – like driving – became a thing of the past. Willie was, however, nothing if not determined. Nan died 2009 and Beth and Lindsay had their hands full with him. He didn’t always do what he was told! With no car Willie walked down to the village twice a day. That was good for his physical health, but he began to fall. So many folk came to Willie’s rescue. Everybody knew him and so many people helped him up and took him home. Often he hurt himself. Often an Ambulance had been called. So many people helped Willie in his time of need and the whole family especially Beth and Lindsay are very grateful to so many Brodick residents for helping him.